Recently, I picked up a Raspberry Pi2, just to see what all the excitement was about. I ran it through its paces, putting all of my favorite obscure operating systems on it (as per my standard practice when dealing with new SoC boards). It successfully ran FreeBSD, NAS4Free, Raspbian, and RISC OS. My favorite of these, at least on the Raspberry, is RISC OS. It’s the one that gives the best impression of speed, although that is an impression based only on the responsiveness of the GUI. Since RISC OS uses only one core, it’s never going to process “R” statistical package weather forecasting data faster than the Raspbian OS. That’s not very important in my case – but perception does count when all you really want to do is read news headlines! After playing with the Pi2 + ‘RISC OS’ combination for a while, I decided that it worked well enough to make a more permanent arrangement of it. Towards that end, I obtained a (slightly large) enclosure to make yet another homebrew tablet form factor computer. Dangling wires make me crazy, so I like to build homes for the SoC based SBC boards that I decide are worth the habitat. Dragging a bare board, dangling wires, an LCD, a power supply, a keyboard and perhaps a mouse wherever I go does not appeal to my sensibilities in any way! 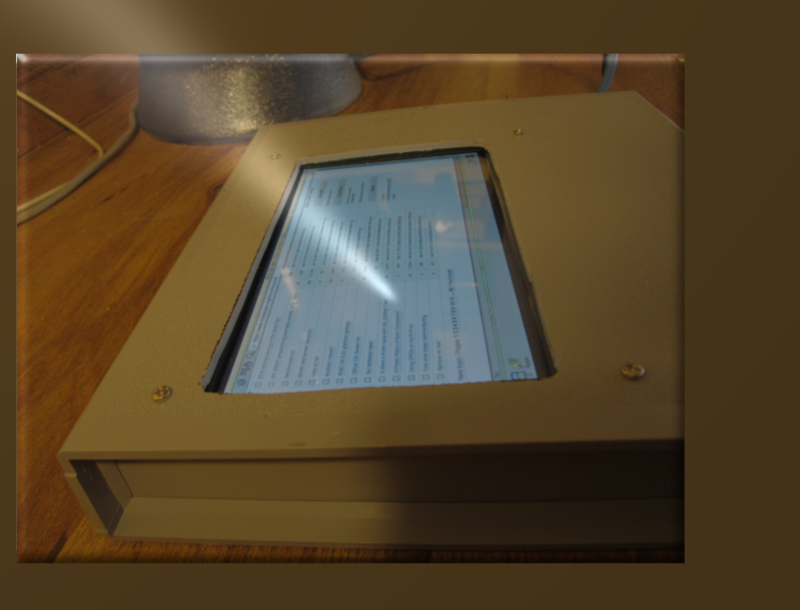 Notice the rough edges of the cutout in the top of the enclosure, made for the LCD. I used a home improvement store quality hand jigsaw to make the hole, and probably should have used a straight edge guide to make for smoother cuts. That’s OK, though – I’ll finish the edges with a rasp, file, and a little sandpaper. Meantime, I have gotten rid of some of the dangling wires, and the whole ensemble is MUCH easier to carry from place to place. Now comes the amazing part. RISC OS booted to a screen in 1920×1080 mode, and looked good doing it! Apparently, there’s some GPU magic going on there, to make the display render modes that are higher than the advertised resolution! Quite a bit higher! But, my eyes are not what they used to be, and so I downgraded the RISC OS desktop to a more practical 1280×720 mode, so as to enable viewing the screen without my nose touching it (or almost touching it!). RISC OS is working pretty well with the tiny 2.4 GHz wireless keyboard (it’s not bluetooth) – but I have yet to make the touch screen work. To be truly a tablet, it probably needs a functional touch screen. The Risc OS online forum is a good resource for things like this, and I’ve queried the group there for some insight. The change made the system seem snappier, and it was able to more quickly load web pages via the Netsurf browser. It runs a little more warmly at the higher speed, so I reverted back to the original 600 MHz. The GUI responsiveness seems “good enough” for me at the lower speed. Contact the Raspberry Pi Foundation at http://www.raspberrypi.org for queries about the hardware. The Raspberry Pi2 is a product of the Raspberry Pi Foundation. “Raspberry Pi” is a trademark of the Raspberry Pi Foundation. All trademarks and copyrights are owned by the respective companies.